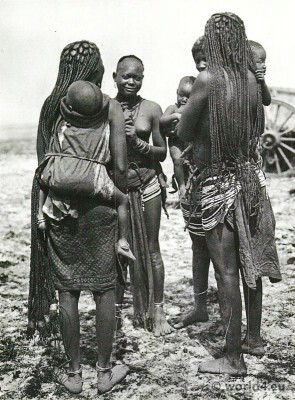 Home » African tribe Ovambo women, Ondonga. Ovambo women, Ondonga S.W. Africa. African tribe Ovambo women, Ondonga S.W. Africa. The Bantu society Ovambo is the most numerous population group of Namibia and is also in the immediately adjacent extreme south of Angola’s largest ethnic group. The Ovambo live mainly in the Namibian-Angolan border region of North Central Namibia, which was called in the German colonial era and the South African occupation Ovamboland. The region lies between southern Angola and the Etosha National Park in Namibia. This entry was posted in 20th Century, 30s, Africa, Hairstyle, Namibia and tagged Traditional African dress, Traditional Namibia Costume on 10/23/14 by world4.